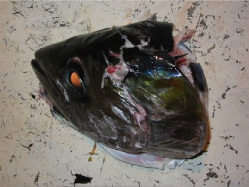 Whale depredation (removal of fish from fishing gear) by toothed whales is an increasingly significant issue effecting the Fijian long line fishery. 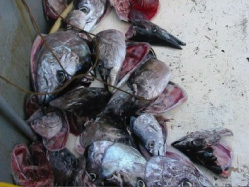 Whale depredation has the potential to make the long line fishing an economically unsustainable activity within the Fijian zone. On a individual vessel trip level it is already having this effect (refer example). The direct loss to the Fijian economy from whale attacks is estimated by Solander to be approximately FJD $20,000,000 annually*. In the case of Solander every tuna taken by a whale is FJD $10-25 lost earnings for our Fijian crew – to the company it is a total loss. As most crew are paid for what is caught whale depredation can result in a complete loss of income of up to 4 days of a 10-12 day voyage. Because depredation provides an additional food supply to whales, depredation causes whale populations to increase beyond their natural carrying capacity. It also impacts on previously-existing behaviours related to hunting or seasonal movements. There are no effective mitigation methods available today even steaming away from an area is not necessary effective – the whales follow. 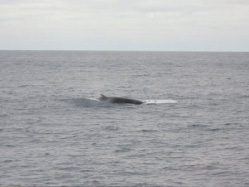 * Solander records all whale interactions for our entire fleet – recent example. 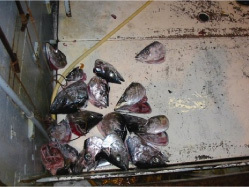 Whales eat entire tuna bodies leaving only the head remaining on the hook/line – only the decapitated heads are brought onto the vessel.